The number and amount of protracted payments and insolvencies remains high, and many private-owned steel and metals producers face serious troubles. In the Chinese steel and metals industry overcapacity remains a major challenge, despite a combined 120 million ton reduction of total crude steel output in 2016 and 2017. 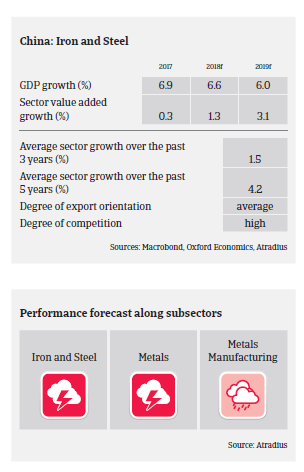 Domestic steel and metal demand is expected to remain robust, supported by increased infrastructure spending. However, challenges have increased beyond further capacity reduction, due to the US steel and metals import tariffs and the ongoing trade dispute with Washington. While the amount of steel exports to the US is rather low (1.6% of total Chinese steel exports went to the US in 2017), the impact on Chinese aluminium producers and traders is much larger. However, facing deteriorating sales in the US many aluminium businesses have redirected exports to other regions (e.g. Europe, Southeast Asia) and enjoy government support (tax rebates). That said, longer lasting US import tariffs and/or an escalation of the trade conflict with the US would undoubtedly harm the industry. Despite some improvements over the last 12 months, the profit margin situation of many Chinese steel and metals businesses remains rather bad. Increased coking coal prices will have an adverse effect on the profit margins of steel producers if higher prices cannot be passed on accordingly. High leverage of businesses has been an outstanding issue over the last couple of years, and while most state-owned steel and metal companies still enjoy good bank facility support, private businesses face more troubles. However, it seems that even state-owned businesses cannot take government support for granted any more, especially in poor-performing steel and metals segments. As in 2017, payments in the Chinese steel and metals industry take between 60 and 120 days on average. The number and amount of protracted payments and insolvencies remains high. While leading state-owned steel makers still show some resilience, many private-owned steel and metals producers face serious troubles. The majority of private Chinese steel and metals traders do not have many fixed assets, and suffer from slim margins and very limited bank facilities. Given the poor credit risk situation in the industry, our underwriting stance remains very restrictive, with cover strictly limited to businesses with strong financial profiles or backgrounds.